Yesterday evening, Ken Cuccinelli held a gathering in Lynchburg to speak with a handful of liberty-minded individuals in the 6th district of Virginia about his race for governor. My understanding is that he sought to create a dialogue between himself and open-minded, libertarian leaders. As such, the chairman of the Harrisonburg Libertarian Party and I made the two-hour drive to meet with him. All in all, there were eight of us including the attorney general and his campaign staffer. Prior to this meeting I crafted a list of the points that I wanted to address, to explain what I thought had gone wrong with his campaign and, in this late hour, what he could do if he wished form a tighter relationship with people like me. However, when Ken Cuccinelli looked at me, I confess that I became extremely disheartened. As my longtime readers know, I have a lot of respect for the man. But when I looked into his eyes, I didn’t see his typical spirit of determination but rather the pangs of a soul staring down a bitter defeat. In many ways this election has been a series of unfortunate events for Cuccinelli. Seven months ago, I was all but certain of his victory. After all, he was squaring off against Terry McAuliffe, a man who lost the Democratic nomination in 2009, who has no elected experience, and isn’t particularly liked by anyone, including members of his own party. His major claim to fame is his ability to fundraise and his ties to the Clinton machine. And yet, less than three weeks before Election Day, Cuccinelli stands on the brink of oblivion, on the verge of what could be a particularly unfortunate end to a promising and successful political career. There is no question that the Cuccinelli campaign has gone astray. Last night I tried to make the point that his campaign had failed him, that they traveled too far down the road of negativity without a positive counterbalance losing, not only the undecided voters, but a huge swath of the Republican faithful as well. Yes, they have had one excellent ad, but that was it. The liberty-minded Cuccinelli that many of us came to know and love in 2008 through the early days as attorney general has gotten lost in the mix. Now it is true that the McAuliffe campaign tactics are awful as well, which has only served to sour voters against both men and look to the direction of the issue-oriented Sarvis campaign. Although I had been attempting to speak with Cuccinelli for a number of months, his handlers always turned my request aside. Despite some claims by other leaders in the liberty movement in Virginia, as far as I have observed, Robert Sarvis has done a far better job reaching out to people like me. We also briefly discussed the issue of Robert Sarvis’ exclusion from the final debate. Many of us agreed that if Cuccinelli wants to broaden his appeal to liberty-minded voters, he ought to actually engage Sarvis, including supporting his inclusion into the debate. In a recent article, the press reported that only the Cuccinelli campaign holds Sarvis back, as both the McAuliffe camp and the debate organizers seem to be willing to allow him in. But I do not believe that Cuccinelli or his campaign will budge on this point, which will only expand the sense of alienation some small “l” libertarians have with Mr. Cuccinelli. Just because I have worked for the Sarvis campaign, have volunteered some of my time, and believe Robert Sarvis is an excellent candidate for governor, I take no joy in the prospect of Ken Cuccinelli’s probable defeat. As I have said many times, I firmly believe that a Cuccinelli victory would be far better than a McAuliffe governorship. Although I applaud Ken Cuccinelli for reaching out and meeting with us last night, to make a more lasting impact such a meeting should have taken place months ago. On the drive back home I wish that I could say that I felt better about the direction of the Cuccinelli campaign, but that simply isn’t true. I expect that they will continue down their disastrous path and thus deprive Virginians of a leader who is far better than the caricature the McAuliffe campaign has presented. 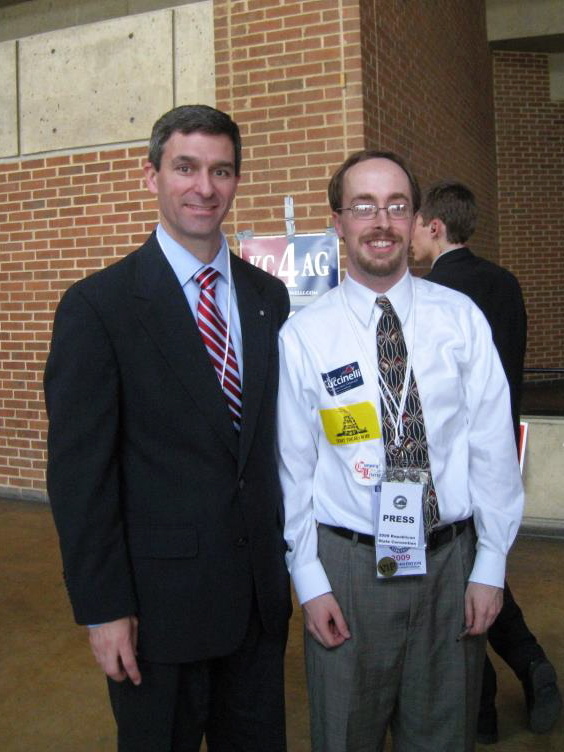 As such, given everything that has transpired and everything that is likely yet to come, I left Lynchburg feeling a lot of sympathy for Ken Cuccinelli, wishing his campaign had taken the time to actually highlight his positives and boldly advocate positions important to those of us in the liberty camp.